AEW Capital Management, L.P. has selected JLL to manage and lease The Shops at Highland Village, a 352,000-square-foot lifestyle shopping center located at 1701 Shoal Creek in Highland Village, Texas. Anchored by AMC Highland Village 12, Whole Foods Market and Barnes & Noble Booksellers, the open-air, pedestrian-friendly center includes 11 restaurants and 60 specialty shops including Banana Republic, White House Black Market, Chico’s and Jos. A. Bank. The property also includes more than 29,000 square feet of office space. JLL Vice President of Leasing Brenda Ford and Senior Vice President and Regional Manager Rick Vita will lead the assignment. Last year The Shops at Highland Village underwent a multi-million dollar capital improvement program that resulted in common area renovations, upgraded landscaping, new amenities for adults and children, updated facades and new signage throughout the property. 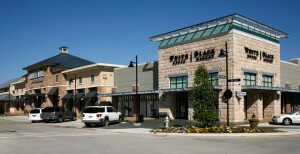 Located at the corner of FM 2499 and FM 407, The Shops at Highland Village serves the upscale communities of Flower Mound, Highland Village, Denton, Lewisville and Argyle. There are few high-end retail properties in the area, and the 12-screen AMC Highland is the area’s only movie theater. Over 70 percent of the property’s retailers are national tenants.